or runners in the central park. batted about by the breeze. together, flung over the lines. when the ferryman sleeps on the overnight. of town, certain he has no home. but he can’t shake the feeling. he walks around like a madman, it being the only way. But no one notices, the stock market doesn’t answer. But no, I don’t feel invited. and winter will clip its wings. the pedals and grinning on a day in May. a reaction in a silent movie. Men selling strawberries and cherries under the counter. Drunkards before it gets too hot. and white-collared bankers preoccupied with grannies. preoccupied with public order and noisy musicians. Peace seekers and those robbed of peace. Woman selling bouquets & those who thank with no, thanks. Skaters in baggy pants & dustmen in orange-green. Who is it that sends them in no light to turn the wheel? it’s written on their faces. Everybody in traffic has his own. and old believers convince fresh converts. A run-over sheet of newspaper. and nailed on the subculture walls. will give a different answer. It brings winter and hard times for cyclists. Turns everything into a question of absence. with lollypops and big eyes don’t know what to do. and rappers need them for rhymes. Try to pedal in the dark. 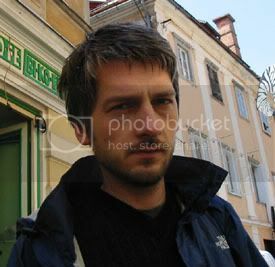 Primož Čučnik, born in Ljubljana in 1971, has published five collections of poems: Two Winters (1999), Rhythm in Hands (2002), Chords (2004), New windows (2005) and Selected poems (2006). He translates from Polish, writes literary criticism, works as an editor for the magazine Literatura and runs a small-press Šerpa.